We’re revisiting our 7 “all year” resolutions, to readjust and refresh! We’ve also got 4 tips to help you get inspired to take a few moments to reflect on your resolutions and aspirations. Have you ever had a day off, thinking you’ll get so much done, and then you end up stressing out over all of the things you planned to do but didn’t get done? I just had one, and it ended in a half a bag of chocolate chips disappearing before my eyes, along with that frustrated I’m-no-good feeling hovering over me. Know what I’m talking about? So, I’m taking a step back today and truly going to be good to myself. 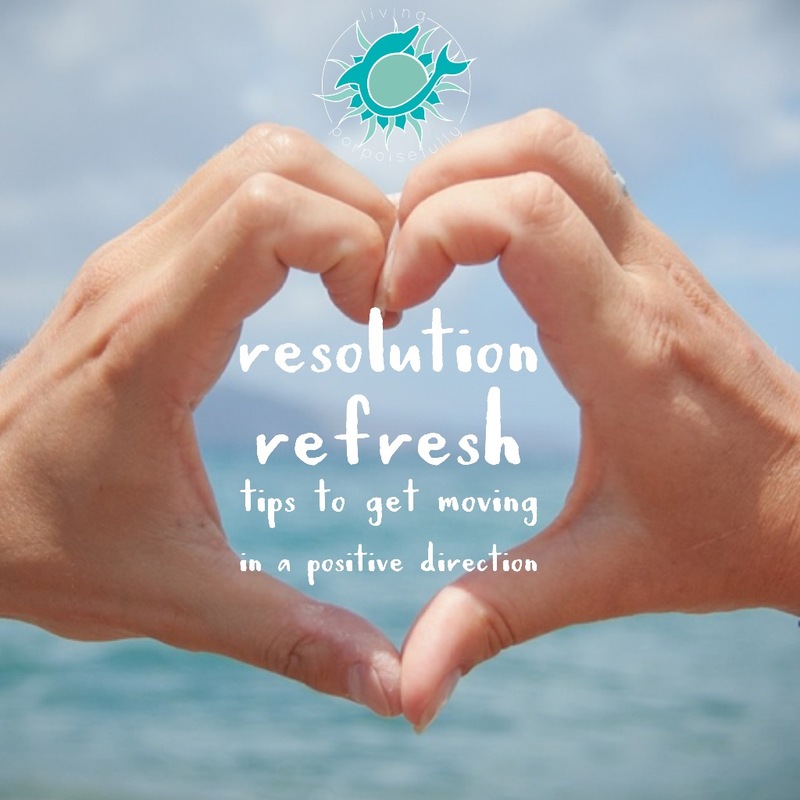 It’s a great time to revisit our 7 “all year” resolutions from January to readjust and refresh! 1. Consciously take time to be still each day. The benefits of taking time to be still are so beyond worth it…but to stress out over not being able to fit it in just makes it worse! Refresh: Keep working it in as regular as possible, but don’t stress out over not doing it. 2. Spend time in the ways that balance us. It’s amazing how trying to fit in all of the things that give us a sense of balance in life can be difficult, and almost unbalancing! Like we said in January, it is forever a challenge, and each day is its own individual quest. Refresh: Continue to strive for balance, but realize that sometimes imbalance is a part of life. Cherish the times that do feel in perfect harmony. We’ve gotten a bit derailed with weather, work schedules, illness, travel, and all sorts of ongoings that life brings. So we’ve got to recommit on this one but not so much that we get burnt out! With warmer weather and more sunshine this time of year, it should hopefully help out in our favor. Refresh: Recommit to our exercise goals, but make it a gradual shift to avoid burnout. 4. Express gratitude each day. We have so much to be grateful for, and we find those feelings of gratitude coming up especially on a walk in nature, or at night before bed. Refresh: This is one thing we’re pretty regular about, so we’ll keep it up in expressing our gratitude. 5. Connect with loved ones. Time flies, and often with it, so do opportunities to connect with loved ones, life’s most meaningful treasures! Refresh: Some weeks we’re better than others on this one, but that’s ok. Keep connecting meaningfully. 6. Do more of what sets our souls on fire. Ah we can’t get enough of this one. But, we’ve got to take care of ourselves so that we have the energy to do our passions of working on our new children’s books and creating sea-inspired goodies to share. Refresh: Keep that passion rocking and be proactive about setting aside time for it! 7. Be a friend to others and our environment. This endeavor is always ongoing, in truly caring about others and the impact we make on them and our environment. Refresh: Bring more of those genuine smiles, seize chances to help, and continue to strive to be a positive force for good in others’ lives. With spring in full force, spend some time in the mindset of renewing and refreshing your “all-year” intentions! Today’s a new day and what we set out for ourselves earlier in the year can be tweaked and adjusted as needed. Honestly look at your big picture goals and think about which ones you might have forgotten about that really meant a lot to you, and drop the ones that you made halfheartedly. Make a renewed commitment and list specific steps to get refocused. Write down what exactly you will do and when so that it’s clearer in your mind. Be kind to yourself, take a deep breath, and smile. It’s so easy to fall into the trap of berating yourself over the things you haven’t done or done to your standards (in fact, I’d better hide the other half of the chocolate chip bag! ), so catch yourself and let those thoughts go. Start with a clean slate if your grand plans you had in mind to start with were too overwhelming. Life takes twists and turns, and the important thing is to do what’s right for you now and get moving in a positive direction. And, as you’re taking action on your refreshed intentions, pass on the positivity to others by sharing this article with them. Here’s to refreshed and renewed resolutions! Oh this is such wonderful news!!!! We are beyond excited to hear of your new endeavor, and especially that it’s something you are listening to your heart on! And good for you for taking a “me” day to enjoy your amazing coloring before you start too. We can’t wait to hear how it goes – they are so lucky to have someone as passionate as you! Thank you so much for your note, it made our day.